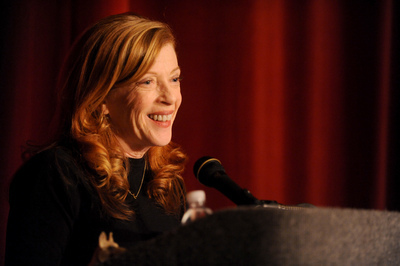 Posted on Wed, Oct 19, 2011 : 8:05 a.m.
Susan Orlean discusses her new book "Rin Tin Tin: The Life and the Legend" at the Michigan Theater on Tuesday. With approximately 500 people in attendance, the 2-hour event began with an introduction by Michigan Theater executive director Russ Collins, who noted that Orlean, while attending the University of Michigan (’76), lived in the same dorm as Zingerman’s co-founder Ari Weinzweig, and was friends with former Ann Arbor Film Festival director Vicki Honeyman. She also anticipated a question that she’s been asked repeatedly, which is: Why did you write a book about Rin Tin Tin and not Lassie? I say, for one thing, Lassie was supposed to be a girl, but was a boy. Secondly, Lassie wasn’t a real dog. Lassie was a character in a book who became a character in a TV show. What fascinated me about Rin Tin Tin was that he did the extraordinary thing of moving in and out of real life and fiction for what is now close to 100 years. After telling Rin Tin Tin’s origin story - he was rescued, as a puppy, on a World War I battlefield in France by American soldier Lee Duncan, who became his owner and trainer - Orlean read two excerpts from her book and introduced the 1925 silent film, “Clash of the Wolves,” which, at one point, had been considered permanently lost. “Clash,” which featured live musical accompaniment by organist Steven Ball, told the love story of a lonely, handsome young prospector and a rancher’s daughter. After the prospector earns the loyalty of wolf pack leader Rin Tin Tin; a swindler tries to steal both the prospector’s fruitful claim and his girl. Following the screening, Orlean took a number of questions from the audience, including one about Rin Tin Tin’s radio shows: “In the end, the dog appears, he barks, and solves the problem,” said Orlean. “(Rin Tin Tin) occasionally did his own barking. Two sisters (and Belleville natives) in Tuesday night’s crowd - Diana Razell of Madison, Wisconsin, and Mary Carey of Jackson - were drawn to the event out of a sense of nostalgia. Jenn McKee is the entertainment digital journalist for AnnArbor.com. Reach her at jennmckee@annarbor.com or 734-623-2546, and follow her on Twitter @jennmckee. Wed, Oct 19, 2011 : 10:32 p.m.
what a great night of entertainment and literature...susan orlean was delightful, articulate, and entertaining...and her book grabbed me instantly. the film, o man, what fun to see the original rin tin tin in action, especially with steven ball's accompaniment to the silent film treasure. kudos to russ collins for making susan orlean's evening such a success! Wed, Oct 19, 2011 : 3:49 p.m. It was a fun night! So happy to see such a large and enthusiastic crowd! Wed, Oct 19, 2011 : 2:40 p.m.
Rin Tin Tin has a statue at and is buried at Asniéres sur Seine...The Cemetary of Dogs just outside Paris. It's a bit of a (morbid) tourist attraction, but fans leave him flowers and gifts and the statue is usually covered with them. Wed, Oct 19, 2011 : 1:08 p.m. It was a great reading and discussion of her book, and the film with Steven Ball's organ accompaniment was tremendously fun. The theater was nearly full and the audience roared enthusiastically every time Rin Tin Tin bit a bad guy. Wouldn't have believed it before hand, but the dog acted circles around the other cast members.